On July 2, 2005, the first "Preservation Partnership" disk was set on the NOAA Heritage Trail at the site of the Calais Observatory in Calais, Maine. The Observatory was established in 1857 by one of NOAA's predecessor agencies, the Coast and Geodetic Survey, as part of the United State's Telegraphic Longitude Observatory network. 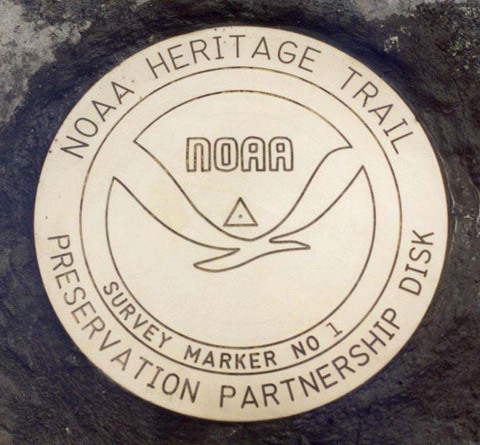 On July 2, 2005, the first "Preservation Partnership" disk was set on the NOAA Heritage Trail at the site of the Calais Observatory in Calais, Maine. The Calais Observatory, established in 1857, helped define Greenwich, England, as the zero point for the establishment of worldwide longitude values—the ultimate reference point for the planet. The Preservation Partnership disks are part of NOAA's Heritage Trail Commemorative Mark Program, which recognizes significant sites or places that represent NOAA's or the nation's heritage. The Calais Observatory was established by one of NOAA's predecessor agencies, the Coast and Geodetic Survey, as part of the United States' Telegraphic Longitude Observatory network. 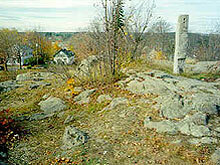 Ruins in Calais, Maine where the Coast and Geodetic Survey's Calais Observatory once stood. The site was last used by the Coast and Geodetic Survey in 1895. Image courtesy of Harold Nelson. In compliance with President George W. Bush's Preserve America Executive Order, NOAA is stepping up efforts to inventory, preserve, and protect historic resources in the agency's care, from shipwrecks to historic buildings. The goals of the Executive Order include greater shared knowledge of the nation's past, strengthened regional identities and local pride, increased local participation in preserving the country's cultural and natural heritage assets, and support for the economic vitality of our communities. On December 16, 1866, the Calais Observatory marked the final piece of the first successful transatlantic telegraphic longitude determination. This was a tremendous advance for the transfer of accurate time across the Atlantic Ocean. It provided for the precise determination of longitude at the Harvard Observatory in Massachusetts, relative to Britain's Greenwich Observatory, increasing longitude accuracy throughout North America. The achievement was a major step in ultimately defining Greenwich as the zero point for the establishment of worldwide longitude values, affecting all nations.